How Do I Transpose My Sheet Music into Another Key? Your Questions Answered: How Do I Transpose My Sheet Music? One of our goals for this blog is to provide a resource to help you make the most of all the added-value features Musicnotes sheet music offers. Song transposition is one great example! Many of the arrangements on our site include the option to transpose the song into different keys. When you purchase a piece, you’ll have all transpositions available to you in our free web, PC and mobile apps. If a song has transpositions available, you’ll find them in the right-hand column of the product page, as seen in the circle of the image below. You may click on any available transposition to preview/listen to the piece in each key. Oh, and if you don’t see the key you need in the available transpositions, just let us know! In most cases, our professional musicians can transpose it accordingly and have it ready for you within a month. There’s no additional cost for this service, as we’re happy to help! 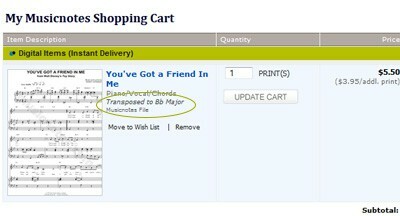 Now, if you decide to purchase and download that great new arrangement, you’ll want to make sure that you add the correct transposition to your cart, because although you’ll have all transpositions available in the digital file, you may only print a single transposition. You can always double-check that you’ve placed the right key in your cart prior to checkout. You’ll find the key information (if not in the original key) underneath the scoring in your shopping cart. But, if you happen to checkout with a transposition other than the one you really wanted, have no fear. There’s another opportunity to change the key of the piece you print in the Musicnotes Print Center. When you go to print your digital sheet music, you can choose any one of the available keys by clicking it on the left hand side. (Note: Chrome users may not see all available transpositions show up in the Musicnotes Print Center. We suggest switching to a different browser for printing.) Your purchased key will automatically be selected and highlighted, so if you hit “Click To Print” that’s the key that will print. Once you double-check that the correct transposition is highlighted, simply click to print out and enjoy your new, professionally transposed sheet music. Every now and then, we’ll hear from a customer who, despite double-checking, accidentally prints the wrong transposition of his or her sheet music. In most cases you’ll legally have to re-purchase the arrangement in order to print out a different transposition. Each transposition of a song is considered copyrighted material, so you must purchase another copy in order to comply with copyright law. The silver lining is, we now offer discounts for additional copies of your arrangement. 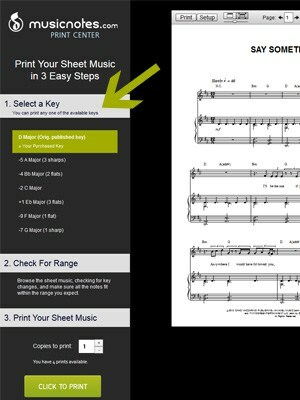 As long as you’re signed in to your Musicnotes account, each additional print out of sheet music you’ve previously purchased automatically rings up at the reduced rate. This means the arrangement’s copyright owners receive their fair, legal compensation and you receive a perk for being a loyal customer. Because, after all, the great musicians who use our service are the inspiration behind everything we do! 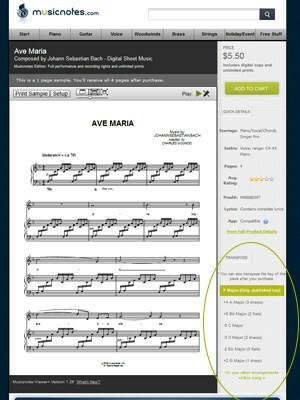 Do you have a question about digital sheet music that you’d like answered? Leave it in our comments below, and your inquiry could be featured in a future ‘Your Questions Answered’ post. For the active musician with a band with instruments in C,Bb,&Eb.and gigs planed, waiting a month for transposing just doesn’t work. Not only are you losing a lot of business , your really making it hard on the guys who are in charge of getting the music.I know with the right software programs this could be done almost instantly. We would be willing to pay for this and the royalties that are due. Sincerely, Bob R.
In our church we have several worship leaders and back-up singers. Depending on the combination we have to transpose songs into different keys. Why is it not possible to get it in such a format that we can save the songs to out computer and print it in different keys as needed. We’re still playing the same song. We do not change the arrangement, but only the key! In response to your great question, the purchase of your digital file only includes rights to one print-out of the sheet music. Additional transposition print-outs would be like making photocopies of your sheet music, which is in violation of copyright laws. We are, however, able to offer a great discount on additional print-out purchases of your piece. You’re able to make the original purchase and print your sheet music in any key you choose, and add any/all transpositions you need for a greatly reduced rate per print out. I agree that I can not give copies to other people, but in my opinion I can indeed make copies for myself and that would not be against the law. Actually, when I have the sheet music I can make the transposition of the chords myself, but sometimes it’s a lot of work for several songs. If music distributors would be more client friendly on this issue I’m sure all would benefit from it, including the companies. I am trying to locate “Lady Godiva” by Mike Leander in the key of C major. I purchased “under god’ in the key of G and I need it in F.
Was searching for “Evgeni’s Waltz” from the movie, W.E. you don’t seem to have it. Was finally able to locate a copy of it elsewhere, but it has 6 flats! Need it transposed. How can I get this done? Please contact me ASAP. Thanks! Can I get gospel song -On Heavens Bright Shore in key of d flat ? Greetings, Thanks for all you do! I am wanting to Transpose “Fortuosity” From Disney’s Happiest Millionaire, but it looks as if there is no other key available. I am looking for Piano/Vocal/Chords sheet music in F Major. Would you be able to help me with that! Help. I purchased “Smooth” (with Horn Parts Parts) by Rob Thomas and Itaal Shur. The song is in the key of A minor, but the horn parts are written in B minor. How can I transpose the B minor horn parts to A minor, so I can play the horn licks on my keyboard?